"In all the battle cruisers there are two main "Dressing Stations" - one in the fore and the other in the after end of the ship. The fore dressing station is below the main deck, and is surrounded by about 9 inches of armour, and here the majority of instruments and dressings are kept, since it is the most protected and convenient locality for operations. In size about 10 feet by 15 feet, there were two bunks against one bulkhead (or wall) of the station for bad cases; a small medical store-room adjoined one corner and a folding operating table, with another small table for the tray holding the instruments, was rigged in the centre of the station. The Surgeon-Commander was stationed here with a party of ten hands, which included the stretcher party. 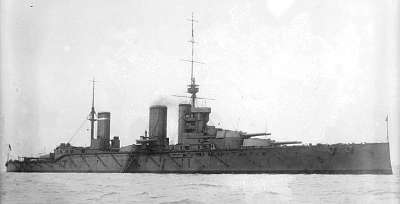 A similar party was aft on the port side of the mess deck, unprotected by armour, but possessing the advantages of accessibility, an X-ray apparatus and hot water leading to it. The first-aid party, all told, was about thirty strong - three medical officers, the chaplain, five sick berth ratings, and about twenty ship's police, cooks, stewards and writer ratings, who were trained in first-aid duties but had no skilled medical knowledge. Each gun turret* had two of the first-aid party, with a supply of tourniquets, bandages and simple dressings. Shortly after 2.30pm enemy light cruisers were spotted and we went immediately to action stations. Shortly after I entered the foremost dressing station, a terrific crash was felt and several of the party made a somewhat violent acquaintance with the deck. All lights went out and we were left in darkness. Two oil lamps were kept for emergencies and after lighting these, we looked round to find only one casualty among us and this a fairly large scalp wound which may have been from a fragment of shell. I cannot be certain but next day shell fragments weighing some 3 lbs were swept up from the deck of this station. The light from the oil lamps was very poor, and vision was further obscured by the heavy whitish fumes which began to descend into the compartment, and which could not be cleared away as the ventilation fans were always, by order, shut off in action, owing to the danger of flooding compartments below the water level. The atmosphere became very unpleasant, the fumes being irritating to eyes and throat. The gauze respirators in use at that time (1916) were ordered to be put on, and were distinctly useful for a time, but later on the atmosphere became to unbearable that I sent a message to the Flag Captain asking for permission to take up our stations on the port side of the foremost 4-inch battery, situated on the upper deck under the forecastle. Whilst waiting for permission, the first-aid party continued to dress casualties as they occurred. We dressed several cases of burns occurring amongst members of the fire and repair parties - exposed and dangerous jobs in any action and I'm afraid they suffered many casualties. Other casualties began to arrive, and amongst them a gun-layer from the after turret, which had been put out of action by a direct hit. He, poor fellow, had a foot nearly blown away, but had been very skilfully dealt with by the first-aid party in the turret and stretchered to us. Later, I amputated his leg, from which he ultimately made a good recovery and is, I believe, still serving but his operation, at the height of the battle, was hampered by poor light making securing the arteries particularly difficult. However the electric light was suddenly switched on again and everything became comparatively easy. Meanwhile the fore dressing station, operating by oil lamps, was working unceasingly amongst the casualties taken there - chiefly burns but some serious wounds from a shell that had penetrated the upper deck in rear of the mid-ship turret on the port side. I then proceeded to operate on a man from the Royal Marine Artillery who had been brought down bleeding seriously from a punctured wound on the face. We had hardly started before rapid firing developed, and the tray with all my instruments was deposited on the deck. However, with a fine disregard for modern aseptic principles, we carried on. The dressing of burns, some very extensive, now fully occupied the time of the whole of the staff. The most serious of these casualties were laid out on mattresses outside the Admiral's cabin or on the mess deck. The first-aid party worked hard at tending them, aided by a stoker on the sick list who was later promoted by the Captain for the valuable assistance he gave that night. By about 11 pm we had things in fair order and I was able to go to the ward-room for some food. There, I learned that further action was expected when daylight came but at dawn nothing of the Germans was to be seen. During the next day, (June 1st) we buried the dead at sea and on the following morning discharged our wounded to the hospital ship HMS Plassey." *See the article on HMS Lion for a gun turret diagram.